Strong Magnitude Earthquake Strikes Mexico : The Two-Way The quake was centered 120 miles east of Acapulco. 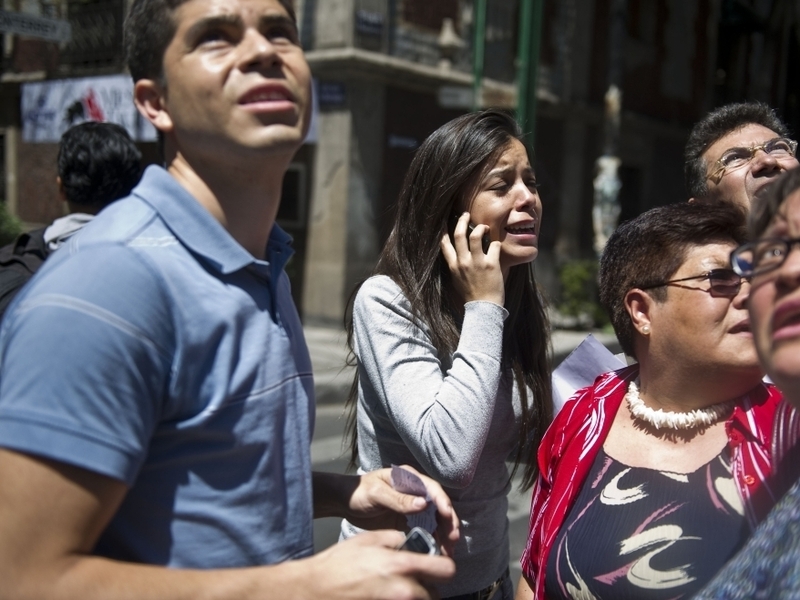 Many people went into the streets after the strong quake rocked Mexico City. The USGS says an earthquake with a magnitude of 7.4 hit southwest Mexico today. The United States Geological Survey says it was 6.2 miles deep and about 120 miles east of Acapulco. NPR's Jason Beaubien, reporting from the Zocalo area of Mexico City, says officials report no deaths and no major damage. "And here in the capital," adds Jason, "things have just very quickly gone back to normal." President Obama's oldest daughter Malia was on a school trip to Mexico when the earthquake struck. ABC News reports that she is safe. "In light of today's earthquake, we can confirm that Malia Obama is safe and was never in danger," the Michelle Obama's Communications Director Kristina Schake told the network in a statement. The U.S. Geological Survey has revised its estimate of the earthquake's strength again, to 7.4 magnitude. So the size has been downgraded twice — from the original 7.9 to 7.6 and now 7.4. On his twitter account, President Felipe Calderón says Mexico's seismology agency says the earthquake measured 7.8 on the Richter scale. He adds, "There are still no reports of major damage." The mayor of Mexico City, Marcelo Ebrard, is reporting no major damage in his city. On his twitter account, Ebrard says they've inspected the central part of the city, the northern part of the city and there are no mayor damages. The airport, Ebrard reports, is also operating normally. CNN Español reports that the earthquake was felt strongly in Acapulco, too. It forced residents to the streets. CNN also reports that slowly office workers in Mexico City are returning to their office towers. Mexican President Felipe Calderón just tweeted that "no major damages have been reported, according to a national seismologist." Olivia Sanchez, a Mexico City resident, just told our Newscast unit that the earthquake shook the city very hard. She said that people are on the streets right now and the lights went off momentarily. She said the phones have stopped working and she can hear helicopters in the air.